Facebook Messenger is trying hard to get into the social space for everything. The app has witnessed significant changes in the past few months, bringing in a lot of new features and enhancements. 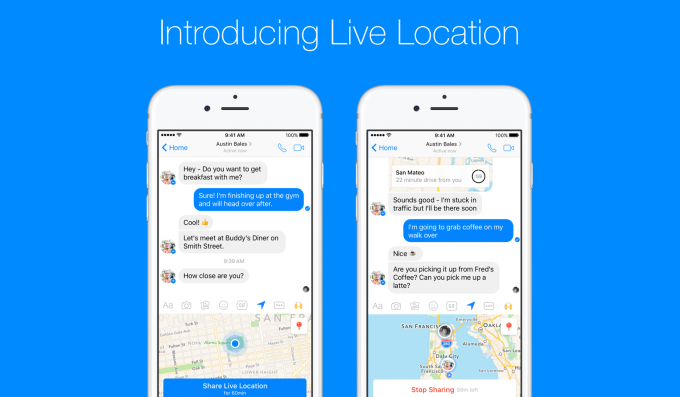 Now, the app is getting yet another new feature in the form of ‘Live Location Sharing,’ which enables users to share their live location in real-time with friends and groups. Through this feature, the recipients can track your movements and estimated time of your arrival at the destination. We couldn’t help but compare this new feature with the one that recently debuted on Google Maps. It looks like Facebook wants to pitch its Messenger app against Google Maps for some of the features. It is surprising to see how swiftly Facebook’s Messenger app is trying to change lanes – from a communication app to a utility app. Also, the new location sharing feature also reminds us of the infamous ‘Marauder’s Map’ feature that was introduced by a Harvard student for Facebook Messenger, which worked with Chrome extension to track your friend’s location. But that was a breach of privacy on many levels, which is why Facebook asked the maker to take it down. Many of us make plans on Messenger that involve finding each other or letting friends and loved ones know we’re on the way. Sharing your location will also help some of you feel safer on the way home. So today, by popular demand, we’re introducing an important capability: Live Location sharing. We put a lot of time and effort into this feature to ensure it was a delightful experience while minimising battery consumption to the point you wouldn’t even have to think about it. It goes without saying that this feature will take a toll on your device’s battery as it heavily relies on your device’s GPS that drains the battery. It would be interesting to see how this feature works for messenger and how many users decide to use it instead of Google Maps. What’s your take on it? Do you think it will reign over Google Maps’ location sharing? Share your views in the comment section below.